The cover is so cool! I love the way that it looks like Harriet is actually jumping out of the book; if you look closely and read the words behind Harriet, you can see that it’s an actual page from the book which I think is really clever. Also, it looks like Harriet has chewed her way through the cover, like she’s trying to escape, which is funny! I loved Harriet’s thoughts. They were so funny and cute! Harriet is such a clever bunny. The character EE (stands for Evil Edward) is a really mean character, but he gets nicer near the end of the book. Tamsyn is so good at writing comedy, so I expected this book to be funny and it didn’t disappoint! A bunny called Harriet Houdini who can do back-flips?! Genius. The idea for this book is amazing and I have no idea how she came up with it – brilliant! Any reader, of any age, will love this book. I read this book in one sitting because it was just so funny – it made me laugh out loud in places. I definitely recommend this book if you want a light, short, humourous read and it would be ideal for your little brother or sister! I give this book 5/5, I loved it! 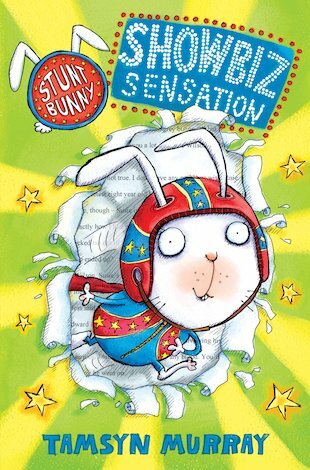 I loved Showbiz Sensation… it was so funny and the main character, Harriet, had brilliant adventures. The best bit was when she did a daredevil stunt. I hope there’s more stories about Harriet! It looks really good from the cover but I got bored with it half way through and gave up. I might try agian one day.